Thanks for thinking of me. Yes, I am free to build and use whatever tools I need to achieve the Common Core State Standards. At the schools where I’ve taught in California and Idaho, curricular resources have been…um, how should I say this…thin. I’ve been given tattered anthologies, class sets of a few classics, and pacing guides that don’t align with actual resources on campus. In a way, it’s been great because I’ve stepped in to fill that gap with the materials I make and now share/sell online. In a much bigger way, it’s a disaster because it’s every teacher for herself and there’s a lack of consistency in what our students learn in their English classes. Depending on which teacher they’re assigned, kids will either grow a ton and be prepared for college-level writing or they’ll watch a lot of movies and make shoebox dioramas. Seriously. Over the years, I’ve heard chatter about district officials wanting to align our classes and give each level an end-of-course final exam, which we call “EOCs” around here. This has happened in science and math, but not English – at least not yet. Sounds like your department is facing the same challenge. One of those tools might be the structured end-of-reading questions that your dept. chair favors – only with a bit more emphasis on the analysis level. But the next day we might use a think-pair-share and another day we might use a fishbowl discussion and yet another day might be a stations activity. Again, there is no single perfect technique to use day after day…after day. Variety is key. Instead of fighting with the dept. chair or suffering in silence, I’d approach him with a list of useful strategies, including the one he favors. My rule is that I can’t complain about something unless I’m also able to propose a solution. Perhaps you and your colleagues could brainstorm a list of best practices? What works with your kids? Start that conversation. There is a remedy, but it’s going to take the brain power of your entire department. And when you crack the code, let me know. I need it, too. Okay, teacher friends, what’s the solution? While I do see a need for more calibration in the English department, none of us wants to read instructional scripts or follow a mandated daily calendar. Is this a problem in your school, too? Has your team already found the solution? Share your experience and leave a reply below! Hi Laura! Thank you for addressing this! My pleasure, Roz. 🙂 Glad you like the graphics. I use a combination of purchased photos from Adobe Stock, images I take and/or make myself with Adobe Creative Cloud software, and photos like the one on today’s post from Pixabay: https://pixabay.com/en/animals-ducks-water-bird-run-2000586/. Happy creating! In our school (in Australia) for Senior English, we have common assessment tasks, which are created by the teachers in each school, then endorsed by the State Curriculum Authority. Each teacher is then free to design their own path to get to that point, supported by the syllabus documents, other school-purchased and/or self-created resources. Generally, what I’ve seen happen in bigger schools is that the English Department will collaborate on writing a unit overview but each teacher still has a fair amount of freedom when it comes to lesson delivery. I’m in a different situation at the moment, because I share my class with one other English teacher and we split the course down the middle. We are the only 2 Senior English teachers. Fortunately, we work really well together, and it means I have almost total freedom as long as I get the kids to the agreed endpoint by the designated due dates. Hi Laura! Thank you for sharing all of your wonderful ideas and lessons! How do you find the time to create all of these wonderful creative plans (of which I am forever thankful!) and juggle your daily classes? I am in my 20th year, and I’m finding myself questioning everything I do in my classroom. I seem to spend my days and nights struggling with the guilt that I am not doing enough! Help!! I need balance, and yet I want to provide my students with the rigor they need to be successful in high school. I teach 8th grade ELA, and I constantly hear from our high school teachers that their students are not being prepared for high school. It’s a rainy Saturday in SoCal today and your blog has brought up some good suggestions. First, it helps if your English department actually talks to each other and gets along. I am currently teaching in a California middle school with a very collaborative English department. We are working on this very issue. Our middle school adopted a new text last year and our district would like us to use the new text 85% of the time. The other 15% we can make adjustments as we see fit. We only have to collaborate when we teach more than one grade. Last year we came up with an outline of the units to teach for each grade level for the three trimesters to meet the usage goal of the district. This year we are working on writing (language and terminology). The eye opener was how many extra hours we give up grading writing every trimester. 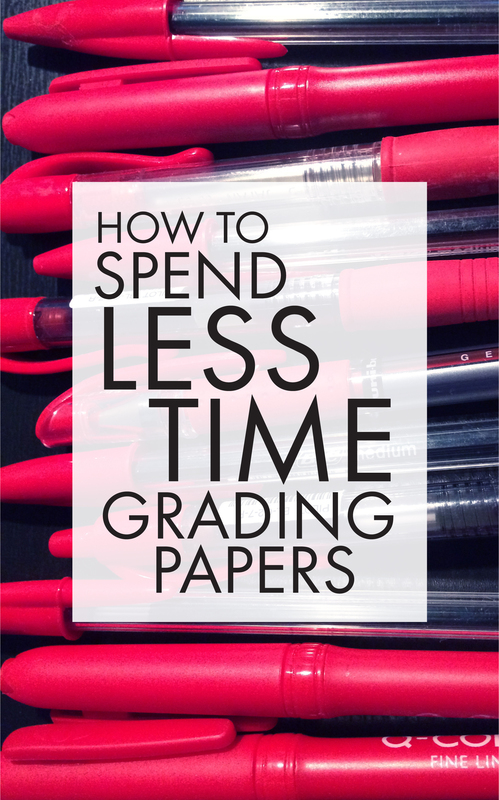 It takes 45 hrs to grade five classes of essays every trimester. I am using your essay grading system. It has helped. Thanks. Narratives are a tough read. I am thinking of suggesting that each grade focus on one writing such as: 6th narrative; 7th lit. analysis and 8th research. All grades work on the elements of writing and the writing process. Maybe we wouldn’t get so burned out. Have a good weekend. Ah, Kelley, I love the idea of the teachers being the ones to create the EOC exam. The district office can then approve it and make sure it’s aligned to the standards. Sounds like a perfect way to ensure teacher buy-in. Love! Oh, I hear you, Connie, and you need to know that there is NO BALANCE in my life. It’s not good. For real. I’ve been running at 100 mph for nearly five years since adding all of this online work to my real-life teaching and, as my husband says, the wheels are starting to fall off the cart. This year something had to give, so I slid into a position at our library as an “education specialist,” where I still build curriculum and teach classes but I don’t have a classroom of my own right now. This has definitely helped (no papers to grade! ), but I still struggle with balance – a lot. Also, I have insomnia and am regularly awake and working at 3 a.m. Again, not healthy and not recommended, but I just tell myself I’ve found the upside of insomnia. How long can I keep going? I have no idea. I’d like to give you the sage advice of not comparing yourself to anyone else and taking the time you need for self-care, but that would make me a hypocrite. I just work all the time. For sure, Kendall. As you wisely mentioned, there are so many elements that need to be in place in order to get this work done. The biggest struggle? Time! We need the time to collaborate and the time to actually build relationships with our fellow teachers. It’s hard to suggest changes when we don’t even really know each other. Sticky and tricky! I’m lucky to be in a charter school that gives us complete autonomy, but with that being said, I agree with Laura that there has to be vertical alignment and alignment within grade levels. We are struggling with a lack of grammar education in the intermediate school, AND my 8th graders are coming to me with either spot-on knowledge that makes them ready for my class or an almost complete lack of those skills along with a lack of the necessary task commitment. We don’t have department heads, but I’ve been where you are. I also agree with Laura that you should bring solutions to the table when you approach this problem with your colleague. I hope everything works out! Thanks, Johnston’s ELA Gems, for your words of wisdom. I guess there’s some comfort in knowing that Carly and I aren’t alone in these struggles. We are in the land of “READ FROM THE SLIDE DECK” and I HATE IT! I’m fighting back because I refuse to be a ‘self-check out’ for my students. Oh, Theresa, that sounds painful…like, death-by-PowerPoint painful. Fight the good fight! Seems to me this is more of a closed-minded dept. chair problem than an alignment one, eh? Is he retiring soon? Sheesh. Our team has collaboration built into the timetable so we (potentially) meet every other day. We have a shared planner that maps out what we’re doing, but it’s always a working document. When we create materials (activities, formative assessments), we share immediately and then adapt what we receive to our students. We have common summative assessments, but there is still flexibility as long as we are addressing the agreed standards. We all have a voice and can propose changes or adaptations as we see fit. We are not lock-step in tandem, but we do know at the end of a unit the content and skills common across our classrooms. A good strategy for me was to understand feedback and independent learning better. I never accept a piece of writing from a student unless there’s clear evidence of self and peer review. Depending on the student, I may well simply highlight a careless error, rather than write a comment and then it’s up to the student to self-correct. If they can’t, of course I’m there to help but if they don’t have the motivation to even ask chances are they would have disregarded the comment anyway. I spend a lot of time at the start of the year building a culture of collaboration, self-reliance, independent access to resources and I feel it’s time well-spent. I also create EdPuzzles and a site where I collect resources students can access for specific issues – I direct them there when I see they need to work on something. This can be done with or without accountability for completion. Laura’s error code sheet has been a great time-saver and I edited it to add bitlys for each of the issues. So, when I mark a code, students know there is a matching resource to explain and help them deal with the error. -The Learning Spy by David Didau – cuts the myths around learning away so you can focus on what works and not worry about the rest. Warning: he can be quite controversial but it’s good food for thought. -http://www.lazyteacher.co.uk/ – he’s not the first to propose that students be held responsible for their learning, but he gathers the techniques and arguments, so perhaps worth a read. Hope this helps someone else in some small way at least. Thanks so much for this thoughtful addition to the conversation, AB. Sounds like your admin. gets it and has given you the time and autonomy needed to make alignment work for the department. Wish we all had that. I’m also looking forward to digging into those blogs. Appreciate the suggestions! In Washington State, we do follow Common Core, but there is no prescribed curriculum. We generally follow Common Core curriculum suggestions, with world lit at 10th grade, American lit 11th, and British lit (partially) at 12th grade. Within our district, we do have a common textbook adoption, which we just completed about a year ago. So we are text-based, but have the freedom to adapt things as we see fit for our classes and personal styles. 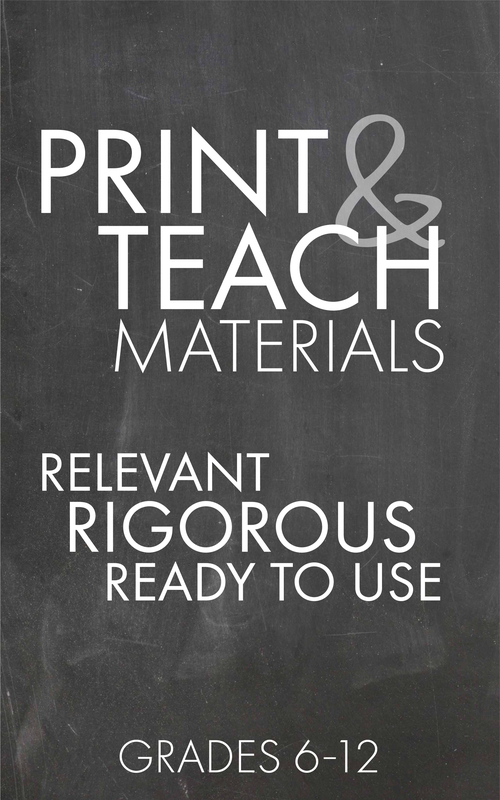 At my site, we are mutually collaborative, and share all sorts of materials, ideas, and work together in grade-level teams to ensure we are consistent in our content and pacing of that content. In fact, we share mini-lessons with each other at our PLC meetings (Professional Learning Community) to help expand our teaching tool box, so to speak. We also meet as grade-level teams/partners to collaborate over curriculum and planning. I consider myself very lucky, as we are like a family in our department, with nobody competing for attention or leadership. And we care about each other personally, celebrating good things in each others’ lives, and supporting each other as we struggle with the difficulties life throws at us. We are very fortunate that our district allows us this kind of freedom, as I know many others do not. Laura, I think you are right to collaborate with the department chair. I think you bring up some good points in your post. Thanks for your post. Thanks, Nicholas, for being part of the community!